I'll preface this list with a little truth that I learned very quickly in our first few months with Lincoln: what works for one, doesn't necessarily work for the other. Every baby, parent, and parenting style is different. I spent a lot of months feeling down on myself because the 'tried and true' things that worked for my dear friends and relatives were NOT working for me. Instead of thinking "this just isn't right for my baby" I thought, "I must be the worst mom in the world." I wasn't. I just had boxed myself into this idea that if it worked for everyone else, it should work for me too. From sleep training to breastfeeding to baby wearing and baby monitoring, I quickly learned that I had to find my own way and do what made me most comfortable. So while these are products that I loved using with Lincoln or am excited to try with our new little one, please take my recommendations as simply that - recommendations. Most importantly, remember, you know your baby (and yourself) best and the best advice is to listen to your heart when making decisions regarding your baby and the products you choose for him or her. There were a LOT of things we registered for with Lincoln that turned out to be unnecessary or just not great products. As first time parents, we just had no idea what we were doing! This second time around it feels really good to head into the newborn stage knowing there is a short list of things we can't live without. When putting this list together I kept two things in mind; items that we felt we couldn't live without, and items that got the most use. I didn't include things that in my mind were obvious, like a carseat, diapers and wipes, for example. Instead, I tried to think of gear that is more of a personal preference but that we found extremely helpful. Whether you're a first-time parent or have been around the block a few times, please don't hesitate to ask if you have any questions for me about the items listed below! 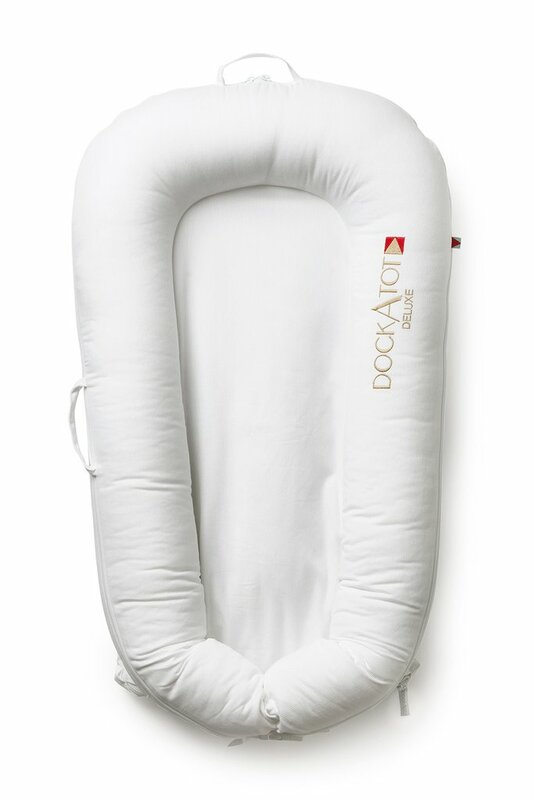 DockATot - Those of you who have been reading for a while know that our first son Lincoln, was colicky. Before his birth, we agreed that co-sleeping probably wouldn't be the best option for us and therefore didn't plan for it - at all. Of course, we had no idea we'd be blessed with a baby who cried non-stop, all day and night, for months on end. You can read more about that here, but long story short, we felt like we were barely surviving (let alone sleeping) for the first four or five months with Lincoln. We did end up bringing him into the bed with us a couple of times, but we were too afraid to allow ourselves to fall asleep that way, since we hadn't adequately prepared for having a baby in the bed. As we enter round two of having a newborn, I can promise you we will not make that mistake again! The DockATot not only allows for safer co-sleeping, should we decide to go that route, it is also a multi-functional lounger, keeping baby safe and comfortable all throughout the house. I'm particularly excited about this product because of it's implications for traveling with two kiddos since we are frequently on-the-go. Having a safe co-sleeper will allow us the flexibility of keeping baby boy in the bed with us and allowing Lincoln to have his own bed or the pack-n-play. There is a simple toy arch attachment that allows the DockATot to serve as a play mat and I can't wait to try that out! I love dual-purpose baby items; they are not only practica, but save space and make life more convenient. DockATot has some insanely beautiful new covers with lots of modern designs, too. Check them out here! Zipper Footie Pajamas- I am a sucker for those cute organic button up pajamas. I just can't help it. But it didn't take long for my inner Darth Vadar to come out when it was 3am and I was desperately trying to change the diaper of a 'mostly' sleeping baby without sending him into full-blown good-morning mode. Nope! In the middle of the night, I want my kiddo in something that is quick and easy to change in and out of because there is ONE thing that matters at 3am (besides safety, of course) and that is sleep. Having lots of these babies on hand will make your life so, so much easier. Trust me! Rock-N-Play or Swing - As first time parents, we felt strongly about not having a lot of baby stuff scattered about the house. We opted not to register for or invest in a swing or rock-n-play type gadget for those reasons. It just didn't feel like a 'need' to us. Well, SURPRISE! Here it is, in my top 10 list! We learned with a challenging newborn that anything.... ANYTHING that brings momentary solace is worth it. Lincoln loved his swing and actually took his very first real nap (at four and a half months, mind you) in it. The Rock-N-Play was also a lifesaver for us. I loved that it was light and easily foldable so I could take it from room to room with no trouble at all. This allowed me to set Lincoln up in it while I took a quick shower, made dinner, etc. and still have him off the floor (we have a big dog) and safe. He also napped really well in the rock-n-play until he outgrew it. If I had to choose one, I would probably choose the rock-n-play just because it's a bit more flexible, but he did really enjoy his swing, too. High Quality Baby Monitor- This is one of those things that all parents differ on. Some think a baby monitor is overkill, some think just sound is sufficient, and others, (myself included) want some serious eyes on their baby at all times. There have been multiple times that this monitor helped keep our baby boy safe in moments of potential danger. He is adventurous and fearless, and therefore finds ways (even in the most baby-proofed of situations!) to give momma a heart attack. If you are like me, I highly recommend the Nest Cam as an option for a baby monitor. We have the original (one of the oldest models) Drop Cam Pro which was actually purchased for us four years ago to use as a doggie cam (yes, I'm that dog-mom.) I used it for two years watching Oliver while we were away before Lincoln was born and then it became our dedicated baby monitor. You guys, it's four years old, has been used pretty much daily that entire time, and still works as well as it did the day we got it! The Nest Cam has excellent video quality, night-vision, two-way sound, and the option to actually record and log your videos if you choose to pay for that extra service. We love that we can access our camera from our cell phones no matter where we are, or from the computer, iPad, etc. 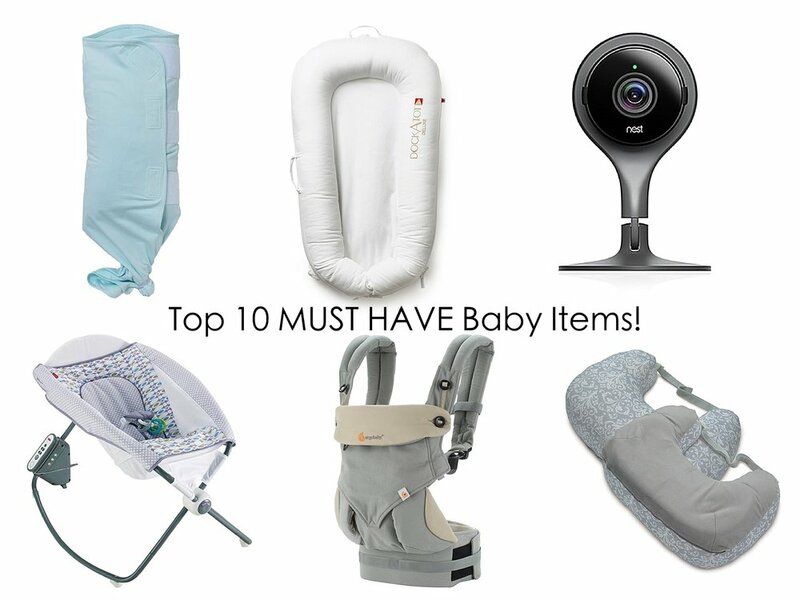 There are LOTS of great options for baby monitors out there. This is just my personal favorite! Jogging Stroller - This might seem like an odd one, but our jogging stroller has been so good to us. I am 100% a proponent of skipping the travel-system (carseat/stroller combinations) and going straight for a higher quality jogging stroller that will stand the test of time and provide you with a successful experience regardless of the terrain. We have loved our single BOB so much over the last two years, there was no question for us when it came to the decision to get a double. Our BOB has gone with us all over the country and across oceans, and has served us well on old brick streets, wooded trails, and white sand beaches. There is nothing worse than being out on an adventure with your little one and being confined to perfectly smooth sidewalks and trails because of a less-than-fantastic stroller. I want both of my little men to be able to see the world, and BOB makes that a possibility for us. Baby Carrier -I'm not sure if it was because Lincoln was colicky or just because I liked having him close to me, but we lived in our baby carriers. When he was a newborn, we used a wrap-style carrier, but as he got a little bigger I really relied on my Ergo 360. I LOVE this baby carrier and have used it maybe more than any other baby item we own. From trips to the grocery store, to trips across the country, our Ergo has gone with us and made every moment more convenient. I think it's worthwhile to add that I am a smaller person with chronic back issues (including having had back surgery) and the Ergo has made it possible for me to carry my little one close without doing any harm to my body. I also love that the Ergo is versatile enough that it can quickly and easily be adjusted for use on another person. Both daddy and grandpa have used it comfortably. Boppy nursing pillow - This baby was by my side all day every day from the moment Lincoln was born until after we stopped nursing at a year and a half. I have the Boppy Best Latch pillow, which has one firmer side and one softer, with a belt to help keep it secure. I haven't had the opportunity to try the traditional Boppy to compare it to, but I really loved this nursing pillow and plan to use it again with my second little one. My labor with Lincoln was particularly complicated and the healing process that followed was anything but quick and comfortable. For close to 12 weeks, this pillow was under my bottom anytime it wasn't being used to nurse, and I was grateful for every minute of it. White noise machine - White noise was a game-changer in the sleep struggle for us with Lincoln. It took us a long time to figure out exactly how and what he needed with regard to sleep, and this was one of those 'miracle' changes we made that helped him go from non-sleeper to superstar sleeper almost overnight. The white-noise machines we had registered for or purchased at the start were the kind that come in the form of a stuffed animal and turn off after 10-30 minutes. What we found with those was that our child (not true of every child!) would then immediately wake up the moment it turned off. We finally downloaded a free app that allows us to run white noise in his room (on an old iPad!) all night long, and Lincoln still sleeps with his white noise. There are a LOT of white noise machines on the market and we're currently searching for the perfect one (so we can reclaim our iPad!) but at any rate, a good, long-lasting white noise machine is a must for us. If you have one you love, I would appreciate your recommendation! Bibs and Burp Cloths - Lincoln had terrible acid reflux which meant he was spitting up all day long, and there was a LOT of it. I am not the squeamish type, but baby spit up is definitely on the list of things I would rather never have to deal with again for the rest of my life. It stinks, it stains, and always seems to conveniently land itself in my hair, right down my shirt, or my all-time favorite - on the dog. Yuck. In a few short weeks, I'm sure I'll be getting more than my fair share of this stuff. One thing I did a really poor job of with Lincoln was keeping bibs on him to protect his clothes. In my mind, baby spit up wasn't something that would stain, and bibs were made for eating. Silly first time mom assumptions! Unfortunately, I was wrong, and a LOT of his adorable little outfits were ruined because of terrible staining. This time around, I'll be sure to do a much better job of keeping bibs on baby, even if he isn't a chronic spitter like Lincoln was. Not only will it help prevent staining, but it will help reduce the amount of laundry I have to do!